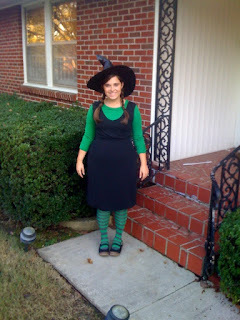 Makin' it in Memphis: Happy Halloween! For the first time in a long time, I'm celebrating Halloween big this year. We've been doing this "secret ghost buddy" thing at work this week and my secret ghost buddy has been rocking it. Usually people think of freshman teachers as the peons of the school world but at my school, the teachers in the freshman academy are awesome... we do all sorts of "special" things including this secret buddy deal. We have a Halloween party on Friday as well. All of that got me in the spirit! For those of you who don't know about Wicked (and you all should because it is my favorite modern musical), it is the back story to the Wizard of Oz. It started as a book but is now a Broadway musical. It starts with the Wicked Witch dying and Glinda the Good Witch bubbling over Oz (a scene from the Wizard of Oz) but quickly goes into a story by Glinda - "she wasn't always wicked..." telling the story of how the Wicked Witch of the West came to be. Elphaba (a name taken from the initials of the Wizard of Oz author L. Frank Baum) was born green and was always a bit different and misunderstood. She shows up at Shizz, the school in Oz, and ends up being roomates with Galinda, a ditzy blond popular kid. They clearly clash and the story that ensues trails their budding friendship. I won't go on from there because I don't want to ruin it but it is a really thought out story that really does a creative job of creating a backstory. I'm reprising my Elphaba role on Friday and Saturday - Friday at school when the teachers all dress up and Saturday at a costume party. Additionally tomorrow I borrowed a halloween vest from my mom and am going to wear it with cowboy boots and a skirt to school. I'll try to post a picture of that too! !